Is Russia About to Attack… Everyone? Dana Weeks: Welcome to ETV, I’m Dana Weeks and today I’m here with Alan Hall, Senior Analyst at The Socionomist. Alan, you just published an article in the October Socionomist titled “Is Russia About to Attack … Everyone?” Now that’s quite the question. Can you tell us what’s going on? There have been a lot of dire warnings like this recently, and fear and tension are elevated. This is seldom a good thing. Dana: What do Russia’s long-term and short-term social mood trends tell us about what may come next? Alan: The longer a society undergoes negative mood, the angrier it becomes and the more likely it will act aggressively. 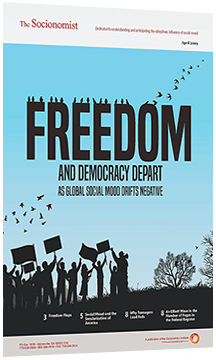 Russia has been undergoing a trend toward negative social mood for more than nine years. Adjusted for inflation, her benchmark stock indexes are down over 50% since 2008, and Russia has been deploying new military technology and using cyberwar, electronic jamming and disinformation tactics. Short-term, we found that the daily fluctuations in Russia’s stock market fit well with the timeline of the Ukraine conflict. This suggests that social mood is regulating the conflict’s waves of concord and discord, and that sharp drops in Russian stocks will precede any conflict. Dana: You published a 20-page socionomic study of Russia in 2007 and made an out of consensus call for both a collapse in Russian stocks and a resurgence in Russian aggression toward its neighbors. How has social mood changed perceptions of Russia since then? The Russian bear is looming larger in the American mind and media. Amazingly enough, Vladimir Putin recently said the prominence of Russia, and himself, in the U.S. presidential campaign indicates the country’s growing importance. Russia is bigger on the geopolitical map, but not in the positive way it was in 2007. Dana: And Alan, coming full circle, bottom line, in your view, is Russia likely to engage in major conflict? Alan: No, not yet. We think it is still early in a global bear market, and societies, including Russia, are clinging to optimism. They still feel they have too much to lose to risk all-out war. Dana: Thanks, Alan. We’ll certainly keep a close eye on this very important situation.